Pin it! Should I set a yoga pose goal? My new year's resolution was to learn to push up to handstand. 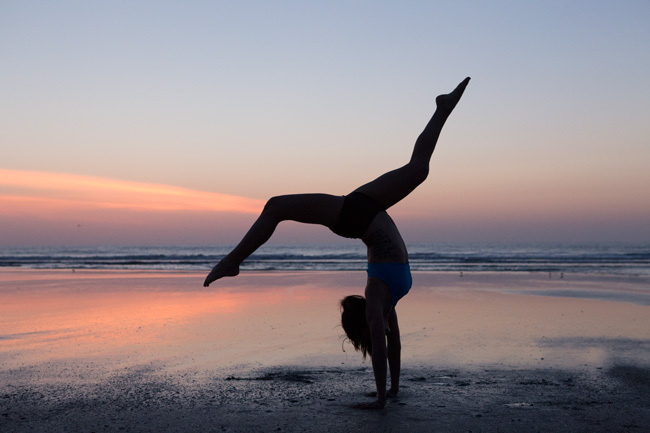 A few months into it, I realized it was a bit of a lofty resolution considering that my handstand wasn't that sturdy to begin with (read: extremely wobbly, often tipping over into wheel pose). It was like just learning to ride my bike and then deciding I should ride in the Tour de France. (Here's an article explaining why that probably won't happen for any of us.) Oops. So, whatever, this might be a New Year's resolution that takes a couple years or who knows, maybe I'll get there by the end of the year, but the most important thing is the journey. I know that sounds like a cheese fest, but hear me out. Physical progress wasn't a surprise to me because it's basically guaranteed, as it is any time you mindfully practice something often. But the emotional factors - the highs and the lows, the sweat, the falling down, the determination, the injuries, learning to be gentler on myself.... It's all such a good process. And that's the point. I mean we read all the time about yoga not really being about the poses, that it's about something deeper. A deeper understanding of yourself. But the poses are the vehicle that get you to that something deeper. So it's not the New Year, but if you haven't already, I encourage you to set a goal. Set a physical goal. Maybe skip the time limit. But know in the back of your head that it's not about the final pose in its full expression. It's about the personal growth, the strength of your will and dedication, and a testament to how well you listen to your body.